On the 20th of November, all the pieces of the puzzle came together. As unique as it is with my busy competition and traveling schedule, it is always amazing to be able to compete at a contest so close to home. Especially when it’s organised by windsurfers for windsurfers! To have that combined with one of the strongest storms we had this year on my last Sunday at home this year made it almost impossible to make this day any better already before it even began! When the original call was made to do the contest, I was pretty sceptical about it, the wind direction looked way to much offshore, making it not a question if it was going to be windy enough but if there would be any waves? As we got closer to the day of the contest, the wind-prediction/direction got better and before we knew it, everyone was battling it out on their smallest sails on the water! I was on my 3.3 Blade and 72 Ultra Kode completely overpowered. The waves were building, everyone was fighting the elements and the crowd on the beach of surprised spectators (some just came to watch the storm at first) was getting bigger and bigger. I managed to score some good waves and was always able to land at least one good backloop to make it all the way to the semi finals. I must say I wasn’t too sure whether I could win in these kind of conditions as some of the other sailors were going crazy on their jumps while I was struggling to just land a good backloop!! 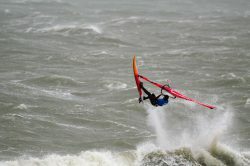 Pim Van der Borgt went for doubles every single heat (in 55 knots) & landed a really good one when I wasn’t even sure if I would go for a normal forward! 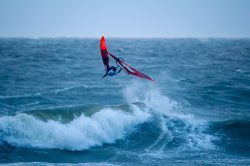 Meanwhile Eric Rutjes tried to even go above that by getting super close to a Pushloop into Forward (yes doubles and push forwards on a national contest in the Netherlands… Windsurfing is more than alive here!) . By the semi finals the wind started to get less, just in time for me to get my 3.6 to probably sail one of my best heats, I felt comfortable and finally had the feeling I was in control again compared to the last two heats where the wind had control over me instead of the other way around. As the tide got higher the waves got harder to read and the current got even stronger than before making it really hard for everyone to stay upwind enough during the 10 min heats. For the final the wind had dropped even a bit more and the call was made to make the final 15 min. This gave us more time to choose the right wave and try multiple jumps. At the time the final started everyone already had gone up to 4.0’s and a bigger board. I don’t know what happened but for some reason I couldn’t do anything during my first 5 minutes. On my 4.0 I was even getting a bit underpowered and the waves started to brake so much more different than before that I felt lost. Also having no watch anymore (as I lost this in my second heat when I was getting washed) I didn’t really feel too comfortable competing without knowing how much time I had left. 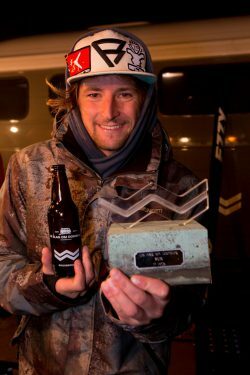 In the end I managed to score 2 long waves which I wrote all the way to the inside and score a good back loop to take the win in these tricky conditions. I actually got washed all the way down the beach so far after crashing my last wave I had to almost get back 1 km upwind to where we started!! By the time I finally made it back to my van I was just exhausted after a day battling the elements! 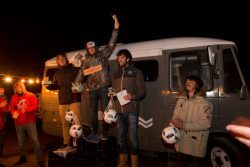 I’m more than happy to win the Slag om Domburg after a tight final in hard conditions! The concept was amazing and I hope, if everything lines up again next year, to defend my title! Thanks to the organizers and all the other competitors, you all made it a day to remember and a perfect end to my competition season! !